Get Fresh. Get Sleek. Gain Room. Lose Clutter. After our gruelling winter season, spring fever will undoubtedly reach epidemic proportions this year. Warning signs include daydreaming, distractibility, and an urge to flee from a dreary workspace. Freshen up with a spring clean of your workspace and upping your game. Make it a space you want to be in. As a start, consider pairing down the number of I.T. devices on your desk to declutter: Two monitors out. One monitor in. This Spring, LG showcases their 34” UltraWide display with Full HD, LED, and virtually borderless design, the LG34WK500. And, the price is less than you would expect – no more than the cost of 2 standard monitors. Gain back valuable desk space from the traditional dual monitor setup: half the cables, half the stands, twice the real estate. Move up and down in size and features within the rest of the extended family – 27-inch to 49-inch all UltraWide or UltraWide Curve, some with QHD Nano IPS technology. Spring is looking picture perfect and crystal clear. Knowing where things are keeps you on top of your game. Piled paperwork often obscures items underneath the stacks, resulting in wasted time trying to find locate items. Filing things where they belong and clearing the things that aren’t needed creates less surface clutter and ensures you know where they’re at when you need them. If you are dealing with sensitive information, leaving it sitting around on your desk can put you or your company at risk. Stacks of visible papers cause privacy concerns. Proprietary information, credit card numbers, financial documents, personal addresses and phone numbers, all could be within paper piles just waiting to be exposed. Room to work doesn’t just refer to the surface of your desk. Your monitor display space is just as valuable. 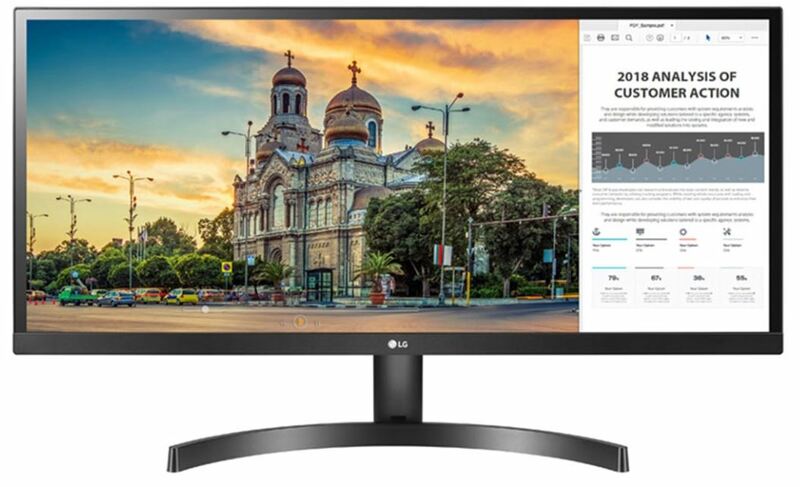 The LG34WK500-P’s UltraWide viewing real estate of 34 inches makes it easy to have multiple documents open at the same time, all visible, in full. Please contact us with questions and for pricing on the different models available.